Anybody know what this is. 1983 Bertram 28. Looks like a ring terminal on a wire...is that the question?? compared to the conditions of the other wires, I'd say the yellow was added more recently. Can you follow it back to where it originates? The ring is not scored at all indicating it has never been connected. I think kross is talking about the thing with the battery terminals and the heat sinks. Perhaps an inverter? Looks like a battery isolator? ibewerik, BostonNS, q0rban and 1 others like this. It's a multi battery charge isolator. The charging source (usually an alternator) and the outer terminals usually go to batteries. It allows the charging system to charge two different batteries but keeps them separate so they cant draw off each other. It's two very large diodes encased with a heat sink. follow the yellow wire and tell us where it goes! so tell us Kross, are you referring to the yellow wire or the battery isolator? Sorry guys for the giant picture. Yes the heat sink looking jobby. 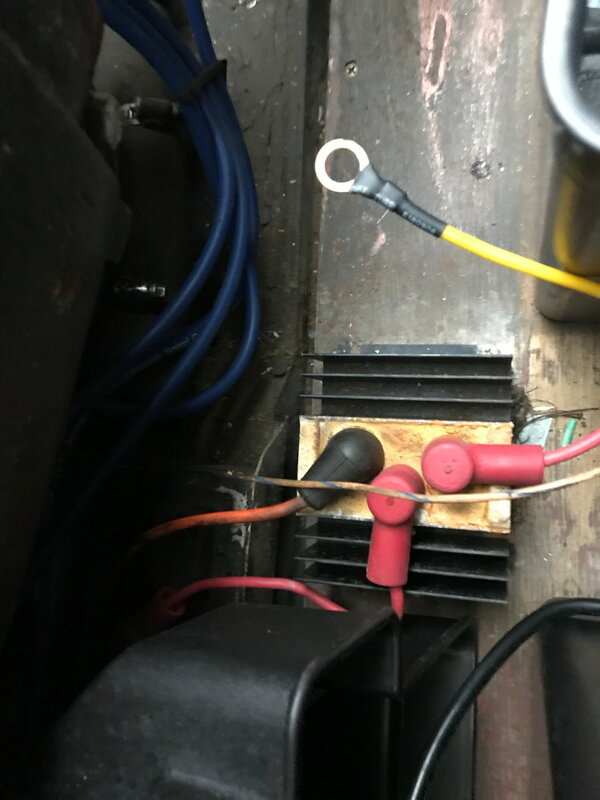 I'd like to know more about the yellow wire with the ring lug.....I have a similar one and would like to learn more about that part.....where does it go, where did it come from? Lol.......reminds me of the Talking Heads song "Once in a Lifetime"
It probably is the negative lead for a newer battery charger. Look for the charger then look up the owner’s manual for it online. Yes the yellow wire is from battery charger.